The Mainz men have been flickering across the screens of the German TV channel ZDF since 1963 – initially in black and white and later in colour. The small mascots are now being presented in a modern neon look. 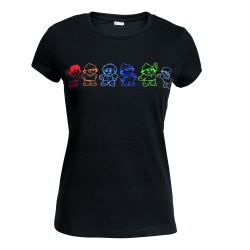 The more stylish, “grown-up” design is based on silhouettes of the popular cartoon characters in strong luminescent colours against a black background. The Neon collection which was distinguished with a Promotional Gift Award 2017 in the category Merchandising comprises of a pencil, ballpoint pen, notebook, pencil case, cushions, iPad sleeve, cup, key fob, T-shirts, shopping bag, registration number frame, postcard and an aluminium sign. All of the items are produced in Europe following a sustainable process, the corresponding Oeko-Tex-certifications are available – i.e. for the T-shirts and shopping bags. Furthermore, the majority of the items are made by brand companies, so that high product and design quality are assured. The filling of the cushions is 100% vegan. The collection is exclusively sold via the ZDF shops and in some cases the small chaps also play the major role as gifts for the employees of the TV channel.